Centro Ceibal: The official organization which is implementing Plan Ceibal was recently renamed from CITS to Centro Ceibal. Its representative introduced the plans for 2011, most of which I already wrote about in the OLPC News article “Uruguay’s Plan Ceibal unveils its plans for 2011”. Additionally it was mentioned that this year approximately 250,000 laptops will be distributed. Another interesting comment that was made is that Centro Ceibal is looking into what to me sounds like a sort of educational content management system for teachers. Antel volunteers: Employees of Uruguay’s largest telecommunications provider Antel also support Plan Ceibal by volunteering for a variety of activities, mostly related to the logistics, distribution, and support of teachers and parents. ceibalJAM! : Gabriel from ceibalJAM! brielfy introduced the organization’s plans for 2011. They will mainly continue their efforts related to the development of educational software, the organization of events and meetings (including the eduJAM! and related activities), and enabling communication and exchange between developers and education people. Additionally volunteers from IBM will apparently also be contributing to these efforts in one way or another. Gabriel closed his brief presentation by emphasizing the importance of the involvement of the larger community and eco-system around Plan Ceibal to ensure its long-term sustainability. 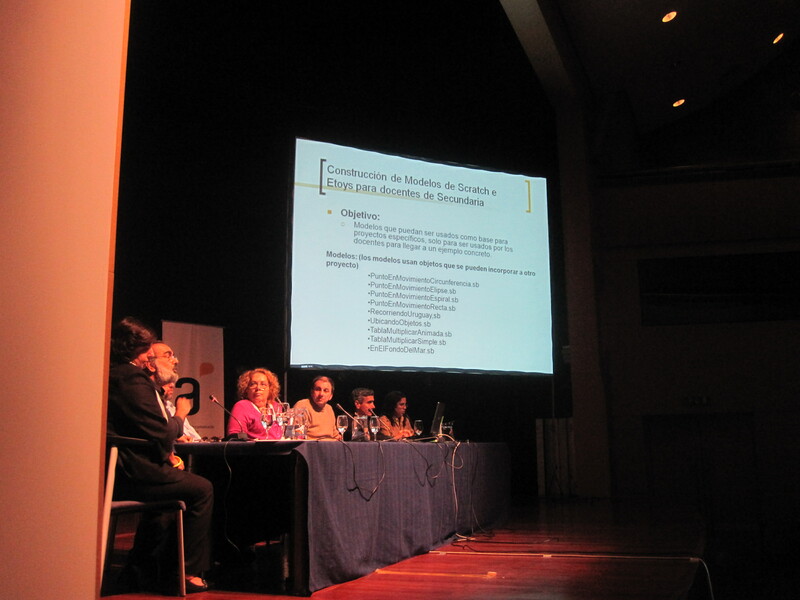 He also mentioned the challenges, conflicts, and frictions which arise out of the collaboration between an institutionalized project such as Plan Ceibal with more informally organized participants and groups. Flor de Ceibo: The representative of Universidad de la Republica’s Flor de Ceibo program showed a great 12min video which demonstrated some of the projects that students enrolled in the program are working on. I’m not sure whether the video is available online but I’ll definitely try to get a hold of it. RAP Ceibal: Several members of the RAP Ceibal volunteer network presented the work they have been doing to support Plan Ceibal around the country. Similarly to the work done by the group I met with in Montevideo last July one of the volunteers from Las Piedras talked about the regular public meetings they are organizing. They are also documenting their efforts, particularly when it comes to maintenance issues for the Classmate PCs (which started being distributed last year), on a blog. As part of the Conozco Uruguay tour we’ll be visiting one of the schools in Las Piedras on Monday and needless to say I’m really looking forward to have time and learn more about their efforts. Two early take-aways I have are (1) the importance of working together with local organizations (such as libraries) which RAP Ceibal volunteers repeatedly emphasized and (2) having regular, in most cases weekly, public meetings to make it easy for pupils, teachers, and parents to get in touch with the RAP Ceibal volunteers. To conclude: This meeting was an excellent way to kick of what will be almost two weeks of exciting activities and events here in Uruguay. Apart from catching up with many of the people I met last July it was simply inspiring and motivating to hear about all the things that people are doing to support Plan Ceibal. It’s particularly great to see that all of the participants are not only continuing previous efforts but also planning new projects and generally trying to expand their reach.